Denver, CO. Lung cancer survivor–advocate Kim Ringen was the top fundraiser in Team Draft’s Lung Cancer Survivors Super Bowl Challenge. Kim and her husband, Davin, represented Team Draft at Super Bowl 50 and the 25th annual Taste of the NFL the first weekend in February. The Super Bowl Challenge participants were part of a friendly competition, with the top fundraisers awarded trips to Super Bowl 50, the NFL Pro-Bowl and the Taste of the NFL. Kim and the other winners, announced on January 4, 2016, will have an opportunity to share their powerful stories with key individuals with influence from across the country. Opening day of the (LCSC) challenge my health declined and I was hospitalized…some would say that the timing was less than ideal – I say the timing was perfect!!! Rather than laying in the hospital bed constantly wondering if I was going to make it through… We were on our phones launching our campaign via social media spreading the word about the importance of research funding. The LCSC gave me a gift…as I was wheeled in and out of different diagnostic and surgical procedures we would get updates on our phones that yet another donation and encouraging comment had came through…This was such an uplifting experience in a time that would have been considered very mentally draining. After having a large wedge of my lung surgically removed I felt my inner fight grow stronger. I have considered myself a fighter throughout these last 2.5 years – but honestly just before the (LCSC) challenge began I felt a drain in my mental stamina…I fully believe the LCSC and the generous loving support from my friends and family ignited my spark..my fight!!! And that is what is keeping me alive!!! The survivors that raised over $1,000 were able to designate a beneficiary for 50% of their funds raised. Kim designated the Lung Cancer Colorado Fund at UC Health as her beneficiary. All of the participants were able to continue raising funds until the Super Bowl, February 7, 2016. Team Draft was founded by NFL veteran Linebacker Chris Draft and his late wife Keasha, an engineer and Clemson graduate who died of lung cancer at the age of 38. “Super Bowl and Pro Bowl week are a fitting time to spotlight the crusade to change the face of lung cancer. The level of commitment, drive and passion required to make it this far parallels the efforts required to get lung cancer research to the next level,” said Chris Draft who co-founded Team Draft with his late wife Keasha to change the face of lung cancer. If it was a Hollywood script, it would be criticized for being too far-fetched. A cancer patient gets inspired to fight against her prognosis by her favorite NFL team, which, despite doubters and critics, makes it all the way to the Super Bowl. Between rounds of chemotherapy, she flies to the big game with the help of a wheelchair and oxygen, meets one of her football idols who lost his sister to cancer and then sees her team defy the odds to win it all. Yet Kimberly Ringen’s tale is not a movie script. 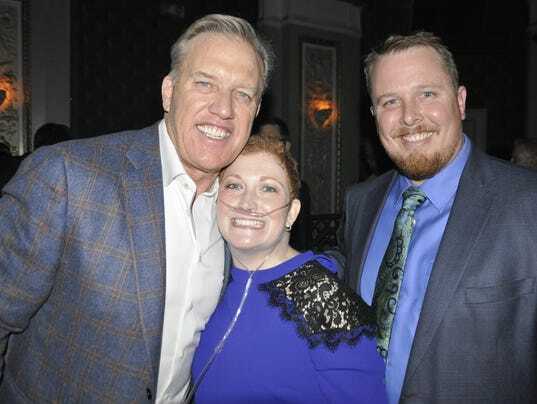 The 38-year-old from Denver won a Super Bowl trip due to her inspirational fund-raising efforts while battling lung cancer, which she acquired through a genetic condition despite having never smoked a cigarette in her life. Ringen’s cancer is still growing and she was told back in 2013 that she had between one and three years to live. But she likens her struggle to that of her beloved Broncos, one that culminated in ultimate victory against the Carolina Panthers on Sunday. Ringen feels the power of football. She lives with it and through it daily. She had one round of high dosage chemotherapy a day before boarding the plane to the Bay Area and is soon due another. It is hoped that the chemo will stop the cancer from growing and enable her get to into clinical trials and undergo modern procedures like immunotherapy. Her journey was made possible through the Chris Draft Foundation, set up by the former NFL linebacker of the same name. Draft lost his wife Keasha, an engineer and Clemson grad, to lung cancer in December 2011. At their wedding a month earlier, Keasha, deeply unwell, asked for money to be donated to the foundation in lieu of gifts. Draft had taken Keasha to the 2011 Super Bowl in Dallas and seen how the excitement and energy uplifted her, despite her favorite team, the Pittsburgh Steelers, falling short against the Green Bay Packers. He now works with cancer centers nationwide to spearhead the Lung Cancer Survivors Super Bowl Challenge, where those affected by the disease compete to raise money for awareness and medical innovation. Ringen raised more than $24,000 to win the top prize, a Super Bowl trip including tickets to the game for her and Davin. Since losing his wife, Draft has worked tirelessly to erase the stigma surrounding lung cancer as a “smoker’s disease.” Many sufferers acquire a genetic version of the cancer that has no correlation with smoking whatsoever. Lung cancer afflicts more people in North America than breast, colon and prostate cancer combined. It has a survival rate of around 17% and such things naturally prey on the mind of sufferers, as well as the side effects of treatment. That’s where football and the Broncos give Ringen a helping hand. Ringen is a trained veterinary oncologist who realized she had cancer when she examined lymph nodes along her collarbone with an ultrasound machine she would normally use on dogs and cats. She was five months pregnant at the time and lost her unborn son as a result of the cancer. Determined to fight and maintaining high hopes that developments in treatment give her a greatly increased chance of survival, Ringen had the Super Bowl prize all wrapped up before the playoffs even started. 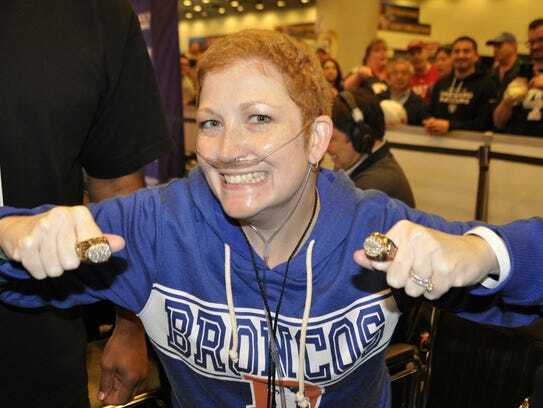 Through the postseason, a local news segment gave Ringen some fame among Broncos fans, some of whom adopted her as a lucky charm. Draft spent two years with the Carolina Panthers, but after seeing Ringen’s love for the Broncos and resilience in the face of adversity, there was only one team he could root for. Follow Martin Rogers on Twitter @mrogersUSAT.